Mahon cheese is one of Spain's best cheeses, it is handmade by one of the most ancient artisan cheese makers left in Mahón (Balearic Island). It is made with raw milk from the "Menorquina" cows, a breed of autochthones cattle from Menorca. Mahón is an authentic delicacy for cheese lovers. Its taste is intense and leaves a spicy aftertaste. 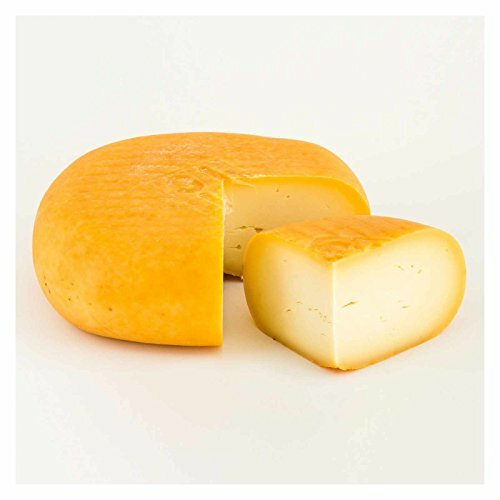 Island climate and extensive production system provide this cheese with a unique flavour. It has a yellow ivory colour with a yellow ochre rind. Its firm texture, and slightly milky flavour reminds us of toasted nut nuances. The flavour lingers in your mouth for a long time. The flavor of Mahón cured cheese is complex and intense, with touches of aged wood, tanned leather or the ripening chamber. Its piquancy increases with maturity, and persistence in the mouth is long. The cheese has lactic aromas, with a slight reminiscence of butter and a characteristic acidity, all of which increase during ripening. Suggestion: try it grilled or with grapes. Tip: pair it with an oak matured white wine. Aged Mahón cheese is a real delicacy for cheese lovers. The cheese is firm, consistent and on cuttings reveals a slightly rough surface with smooth shine. It is a very aromatic cheese with a long lasting taste. Cow's milk cheese is the most famous cheese of the Island of Menorca in the Balearic Islands. Mahón cheese D.O.P. is made from pasteurised cow's milk from the local Mayonese breed as well as friesians and alpine brown in the Island of Menorca (Baleares). It is traditionally served as an aperitif, with a few drops of olive oil and some sprigs of fresh rosemary. Combining it with a a sweet Palo Cortado sherry brings out its personality and strengthens its characteristics. Aged Mahón makes a good aperitif with nuts. It can also be combined with fresh fruit, especially grapes. Semi-aged Mahón can be combined with bread and tomato, salads or as a dessert with jam.